President George W. Bush declared an end of major combat in Iraq as he speaks aboard the aircraft carrier USS Abraham Lincoln off the California coast on May 2, 2003. In May 2003, President George W. Bush stood on an aircraft carrier under a giant ‘‘Mission Accomplished’’ banner and declared that ‘‘major combat operations in Iraq have ended’’ — just six weeks after the invasion. After shifting explanations, the White House eventually said the ‘‘Mission Accomplished’’ phrase referred to the carrier’s crew completing its 10-month mission, not the military completing its mission in Iraq. 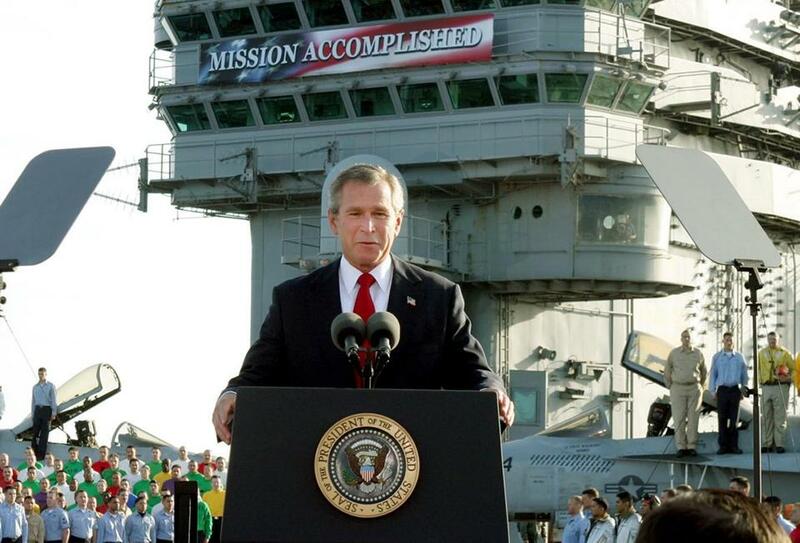 Bush, in October 2003, disavowed any connection with the ‘‘Mission Accomplished’’ message. He said the White House had nothing to do with the banner; a spokesman later said the ship’s crew asked for the sign and the White House staff had it made by a private vendor.